Ahead of his first appearance at the prestigious Venice Biennale, E&M sat down with self-taught British artist Lincoln Townley to discuss his Behind the Mask collection. 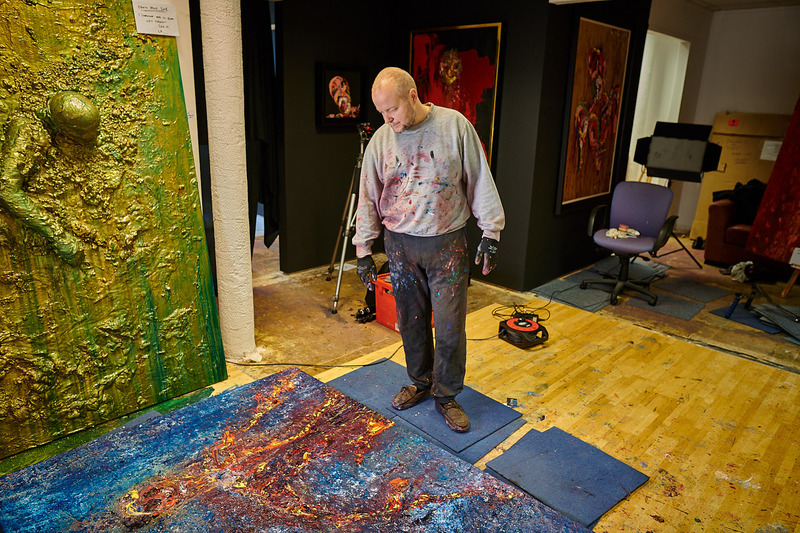 Self-styled ‘art outsider’ and cryptocurrency champion, Lincoln Townley is a London-born artist who doesn’t play by the rules. Far from it: he flouts convention, eschewing the role of galleries and traditional auction houses. With social media his prized promotional tool, Townley—an art world maverick—does things his way. And this subversion, he maintains, drives the value of his work. Dubbed by Michael Caine as ‘the next Andy Warhol’, Townley—whose global influence and star-studded collectors make him the envy of his counterparts—has emerged as one of the leading contemporary artists of his generation. Characterised by aggressive brushstrokes and roiling surfaces, Townley’s work reflects the artist’s bravado and fearlessness in the face of adversity. An artist who is leading the way when it comes to the relationship between Bitcoin and art, Townley uses cryptocurrency and Blockchain to sell much of his work. Everything he sold on a recent trip to LA was through cryptocurrency on Blockchain. This approach allows him to sell his art without needing agents or galleries, which further demonstrates the artist’s iconoclastic tendencies. Townley, the art world’s great disrupter, is shaking up a centuries-old institution. In doing so, he is propelling it forward into the modern age. Townley explained his Biennale show was an opportunity to control his own destiny, instead of waiting for a gallery to arrange the next show. The artist, who revealed he often spent days on end in the studio, also raised the issue of how we all hid behind a certain façade online. In an E&M exclusive, Townley reveals his working methods and advises those looking to dominate the art sphere. E&M: How do you feel about exhibiting in Venice? 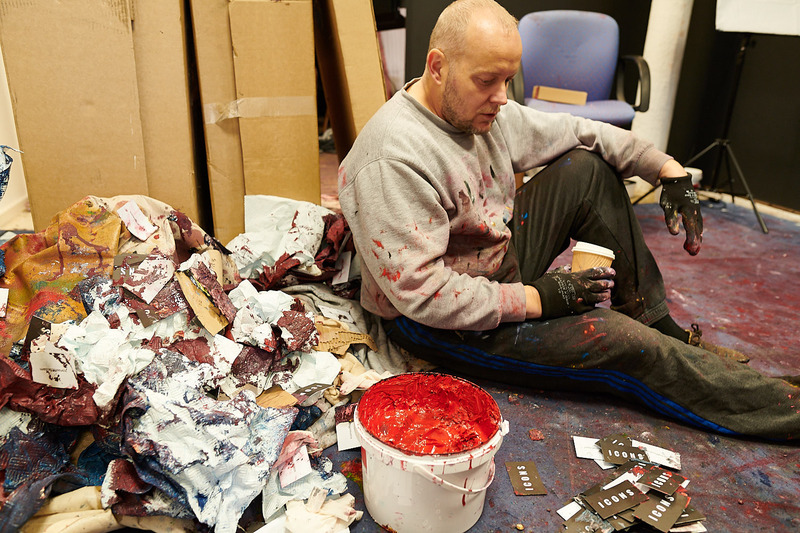 Lincoln Townley: I think there is an incredible artistic environment in Venice; I have never known anything like it. I went out there to see the space, the Palazzo Bembo, and there is just a complete creative energy there. So, to have my work there is not only an honour but I think it is going to sit really well, because of the way I see my work going forward. And Venice, as an area, to be involved in the Biennale is one thing, but to have my work featured in a place with a rich history of people that have struggled to become famous and all the artistic elements of that is incredible. Most of the time I have shown in places that are very city-like—the likes of London, Los Angeles and New York—but this is a completely different environment. There is a different energy there; I am completely atheist, but I believe in energy; I think the energy there is really good. E&M: What advice do you have for young, aspiring artists? LT: Successful artists go out of their way to do things unsuccessful artists are unwilling to do. If you have that mentality when you first start in this industry, I think you’re going to do a lot better. I think that you’ve got to communicate, on all aspects. In most cases, people do know what they have to do to succeed, but they’re not willing to do it. That’s in the work I’m doing at the moment, too. It’s all about what we are comfortable with. It’s like Pink Floyd, Comfortably Numb, people are comfortably numb because they don’t want to do anything, but they want everything. Nothing is easy. To be successful, nothing is easy. You have got to look forward to the ‘nos’. E&M: Is there any particular reason you use oils to paint your work? LT: It gives more energy to the piece, I think it’s more traditional and it adds an element of luxury to the piece. I can’t work very well with acrylics, and it gives it a depth you can’t get with acrylics or any other mediums. Serious work needs to be seriously undertaken. And if you’re going to go serious, you need to be using oils. E&M: And how long did it take you to master the medium of oil? LT: I’ve been doing it for six years. Some of these pieces I have been working on for two years. Some of the paintings I do come two or three inches of the canvas. That’s the way you get the colouring to look very powerful. And you start to understand what colours look best over what colours. E&M: And how long does it take, in general, to produce a work? LT: Some of the smaller pieces I will create and finish in two months. But the bigger pieces, like I say, some of them I’ve been working on them for two years. You can’t apply the oil on top of itself until the first layer and coat are dry because otherwise it will just mix in and become a brown mess, whatever colours you use. So you have got to understand the paint. And that’s a process in itself. But remember, on top of that, I am continuously thinking about marketing. This is the difference between where I am and where other artists get to. They do the work and just expect it to leave the studio, and the agent sells it. But there is a lot more to it than that. I have a selection of agents and it is first come, first served—whoever can sell it, sells it. E&M: In effect, it’s about pre-empting the sale of the painting before it is even finished? LT: Yeah, that’s right; you’ve got to be working towards getting a result pretty quickly. E&M: Do you almost live with the paint and watch the oils change over time? LT: Yeah, at the moment I’m living with 20 paintings. I work on one, one day, and one another day. I’ve got them all around me. And they continue to grow; it’s a very consuming process. When I’m working with this many pieces, I feel like they are all screaming at me to have more paint put on. When I get into my studio, I can be there for three days—flat out. I’ve got a sofa, I lie down on there, go to sleep, then wake up again and carry on going. E&M: And how is the process of working on several works at once, can it be a bit erratic? LT: Yeah, sometimes I come in and I don’t even want to do anything. It’s very strange; you certainly get to know yourself as a painter because you come to understand where you can go with something. If you are pushing all the time, and it doesn’t freely happen, then you’re going to get in trouble, because you’re going to start losing where you are going with the piece. When I’m not painting, I’m sending out emails and connecting with people. It’s irregular. Most artists are conditioned into thinking they can put a piece in the gallery and the gallery is going to sell it. But that doesn’t work. LT: I am inspired by the insanity of mankind. I’m intrigued by what people are willing to do to become wealthy, to become famous—that drive is what my work is about. My work is about looking at what we go through to succeed—in any aspect. That’s what I’m interested in. We go through our lives, this is my belief, completely on autopilot and we are just bombarded every single day, by all sorts of different advertising. And it forms us into the way we behave. And even though most of it is delivered to us in the sub-conscious, it does then form on the conscious mind. We become robots, in effect. I don’t see humans as very free; I try to look at that energy in the painting. And that’s why it’s called, Behind the Mask, because this is about what’s really going on. I’ve got collectors who what they wouldn’t do to succeed, what they haven’t done to succeed, is nobody’s business. But no one is honest. Everybody’s lying. It’s all a façade. And that’s why they are completely bonkers, these pieces, they’ve got paint going on everywhere. The life and energy of the paint is the life force around us. Because we don’t take time; we are never in the moment; we’re always thinking of the past and the things we want to change. E&M: And what role does social media play in all this? LT: I use social media because I want to put my pieces out there and show them to people. But the whole point of it all is that we get brainwashed by it. We aspire to have these lives that, in most cases, we are never going to have. There is so much of that going on in the world and it overspills into social media. I was born in 1972, and I definitely feel I entered the world better than I will leave it when I die. And that’s the way I see the world. 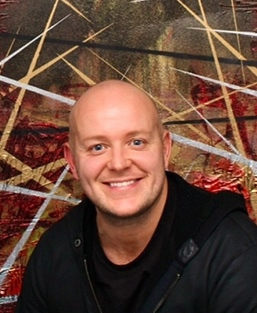 Lincoln Townley is a British contemporary artist known for his expressive figurative paintings. He is the quintessential outsider, the challenger, who came from nowhere to rock the art world to its foundations. Born on December 27, 1972 in London, United Kingdom, he is largely self-taught. He began to focus on his painting after becoming sober and leaving his original career in marketing nightclubs and has cited his past as a source of inspiration for his early work, which was collected by the likes of Charlie Sheen, Al Pacino, and Russell Brand. Townley has exhibited internationally, including The National Gallery, The Royal Academy, Somerset House, The Saatchi Gallery, and The Brisbane Powerhouse, among others. A really fascinating piece and challenging, too, as I’d expect from Lincoln Townley’s no-nonsense style. While I’m unconvinced by the whole crypto-currency thing, I do admire the artist’s disruptive instincts and single-minded drive for success. I haven’t yet seen his work in the flesh, only via social media, so it’s something of a surprise that the paintings are quite so impastose, or that he works exclusively in oils. Scale, too, is something that’s hard to appreciate, but maybe I’ll get the opportunity to see them properly at some point in the future. As for an artist taking on the global art establishment and basically ‘hotwiring’ its juggernaut, well, that deserves our respect and admiration. I suspect, however, Townley, may be alone in this crusade. Thank you for the comment – yes, I hope to also see the works in the flesh soon. As you know, it can be difficult to appreciate art via a screen – social media is, after all, a useful tool – but nothing will ever suffice for the real thing. The Integration Conundrum: Who gets to belong?